In our hot tub installation guide you will find all the costs, specs and details for installing a hot tub inside or outside your house! Footprint: The area that will be covered by the facility, that is, the hot tub and its associated gazebo or slab area. Pump: The device that moves water or air through the hot tub system. It should be able to withstand high temperatures and corrosive chemicals. The sump pump is a special pump for draining water out of the hot tub. Pad: The solid cushioned surface for placing heavy, delicate, or slippery objects, for example for a hot tub. An anti-slip pad protects hot tub users from slipping when walking in and out of the hot tub. GFCI: Ground Fault Circuit Interrupter is a circuit breaker tat damps power into the ground in the event of a short circuit. Winterize: To prevent freezing of water during winter. EPS: The expanded polystyrene foam is a lightweight thermos-insulating material used in the manufacture of hot tub covers. One of life’s little comforts and luxuries is no doubt the hot tub. It relaxes the body after a hard day’s job or on a dreamy weekend. It improves blood circulation, detoxifies the body thorough sweating, and has therapeutic benefits. And the little ones love it too. You do not have a natural spa in your neighborhood, but you can create one in your backyard – a hot tub! But a hot tub does not come cheap. Some of the well-known cover manufacturers are. Before you go out to purchase that hot tub, you need to make a number of choices, each with its own cost implication. You need to choose between portable and fixed, indoor and outdoor, above ground and in-ground, and whether to DIY or get a contractor. You also have to decide on the number of users, choice of material used, size of the tub, features, quality, and so on. Each choice has cost implications. If you have an awkward space or need a uniquely designed hot tub, then you can have it custom-made. Note that a customized hot tub has a starting price of around $13000 and can go as high as $37000. At GCA you can choose a shell of a hot tub and have it customized to your taste. You can choose the number of jets to have, to add underwater or cabinet lighting, to install an anti-microorganism UV protection, type of filtration, to have sound and aromatherapy system. You also get to decide on the amount of cabinet insulation that suits your locality. Alternatively you can simply pick a hot tub from the range of standard models – it costs much less. The off-the-shelf hot tub is cheaper to buy because it is standardized and mass-produced, which lowers its cost of production. A custom-made hot tub is a high-end product that is individually manufactured and therefore bound to be expensive. A high-end hot tub is laden with technology that monitors water conditions such as temperature, pressure, pH, and clarity. It also controls individual jets for each user. It controls the lighting and sound system. Luxury gadgets tend to be expensive with an average price hovering at $120 per gadget. 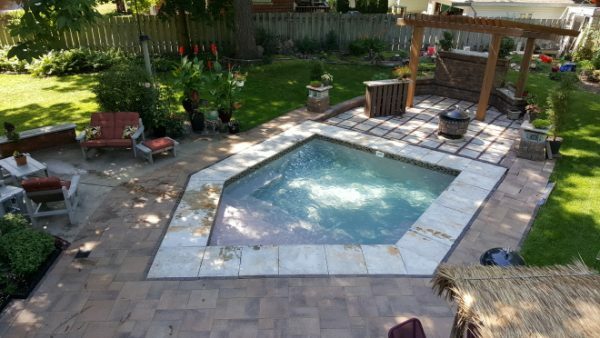 An in-ground hot tub is expensive to install as it involves many processes and days of excavation, concrete filling, and working in a limited space. The excavated soil is dumped on the lawn and affects the landscape. Building materials for the foundation have to be trucked in. They include gravel, sand, and cement for building the foundation and side walls. Fencing poles and mesh wire will be built to make the surround/footprint safer. The ground will be improved by finishing it with stone, tiles, or bricks. The in-ground hot tub is more durable, appealing, and it raises the resale value of a property. Meanwhile, an above the ground hot tub is cheaper to buy and install because it comes in standard styles, is mounted on the surface, takes just a day or two to install, does away with the sump pump, and uses overhead wiring. The hot tub can be installed on a pre-built deck or concrete surface. It is partly portable because you can dismantle and relocate it to a new home. However, the above ground hot tub is not elegant in the backyard and it requires anti-slip stairs to climb into and out of the tub. The in-ground hot tub is heated by either electricity or gas. And it is not as energy efficient as the above ground hot tub. Popular Mechanics estimates that the mid-range in-ground hot tub for four weighs 3000 pounds when full and costs about $8000, while an above ground equivalent weighs 2500 pounds, and costs about $6500. An indoor hot tub requires a specially conditioned room that has to be reinforced on the floor, the walls and floor be waterproofed, the room be dehumidified and well ventilated, and have an access other than the living room. The cost of modifying an indoor room for a hot tub would come to between $15000 and $25000. Although costly to install, the indoor hot tub is usable in all seasons. An outdoor hot tub is designed to blend in with the rest of the landscape. It is also expensive to install where installation may take between one and five weeks, must be covered when not in use, but the biggest drawback is that it cannot be used in bad weather. The cost of preparing the area for a hot tub is about $8000 to $12000. It may seem like the most logical improvement you can make to your patio area is the installation of a hot tub or spa. However, this is easier said than done as high-end, in-ground models average in price from $15,000-$20,000! Luckily, there are alternatives to the in-ground style that are not only less expensive, but also more practical. In this section, we will outline the two main options for homeowners in the market for hot tubs on a budget, the hard-side portable tub, and the inflatable models. Both have their own pros and cons depending on what exactly you are looking for, as well as a significant variance in price. That said, each is affordable by comparison to in-ground systems, and they afford owners the added luxury of changing their minds with regard to relocation. When considering the purchase of a hot tub or spa system, it is a good idea to consider inflatable models for the cost and ease of installation benefit. Not only are these tubs super easy to move around the patio until you have located that perfect spot, but they are also surprisingly inexpensive. In fact, the average cost of inflatable hot tubs designed to fit 4-6 people simultaneously is around $400. This is roughly 2% of the cost of a built in model of the same size! Because these hot tubs are inflatable, they are extremely easy to inflate and pack away seasonally. Many hot tub and spa owners dread the end of the season when they are forced to close and winterize their tubs the same way they would a pool. With an inflatable hot tub, this is not necessary. Simply drain the tub, deflate it, and pack it away in your basement or garage until you are ready to use again! Another highlight of the inflatable tub is the soft, cushiony surface on the interior surface of the tub. This makes for a fabulously comfortable and relaxing experience that is absolutely stock to the tub itself, unlike some of the hard side tubs, which require owners to purchase additional products in order to mimic the same level of comfort and seating. You might still be wondering about the durability of the inflatable tub. Trust me when I tell you, this is not a kiddie pool, capable of popping and deflating at the slightest sharp edge. Inflatable tubs are typically made of PVC or vinyl material that is built to withstand the outdoors and any contact point it might make in a reasonably natural setting. Having considered the pros, it is hard to imagine there is a hot tub option on the market that is better than the inflatable models. Before you take out your credit card, though, it is important to think about some of the areas in which the inflatable tub falls short. While the inside surface is soft, most models do now have seating built in. Instead, when using the pool, you would end up leaning against the edge or sitting flush to the ground. This could be fine for you, but it also means submerging your entire body each time you use your tub. In addition to seating issues, most tubs are designed so that when the bubbles are running, the heat pump stops. This means that if you are hoping gain some of the hydrotherapeutic benefits of the bubbling, you won’t be able to do so for long before the water cools. Inflatable hot tubs also do not offer many additional features. Some models come with covers, but accoutrements such as lighting are often hard to come by. The biggest issue with inflatable tubs is contingent on where you live and what your expected hot tub use is like. Most inflatable models cannot be used and stored outside in temperatures less than forty degrees fahrenheit. This is in part because of the materials used to manufacture the soft, hollow bellied surfaces that are tough enough to hold multiple people and a couple hundred gallons of water. This means that if you are someone living in an area that experiences particularly harsh winters, and part of your vision is to use your tub outdoors, even on cold nights, the inflatable hot tub is not for you. That said, it is perfectly reasonable to store these outside for summer use only, or even bring the tub back inside to a mud or sunroom as the temperature begins to drop. That way you can enjoy the relaxation your hot tub has to offer year round. The other option for homeowners looking to spice up their backyard barbecues late night relaxation in the hot tub is the hard side, plastic tub. The pros to these model tubs are fairly substantial. First and foremost, they are hard plastic, as the name suggests. That means installation is as simple as plugging them in and filling them up. Despite being solid, they are still very much portable. Emptying the tubs is typically enough to move them around until you find the perfect spot in the yard or on the back deck to enjoy a hot soak. Some models even come in pieces that snap together, so they can be stored if need be. The hard-side plastic hot tubs also provide the additional benefit of built-in seats. This is where the hard-side really out performs the inflatable hot tub. Where seating is sort of make shift in the inflatable tub, and uses are forced to submerge themselves entirely, leaning against the sides for seating, the hard-side tubs usually have seats built into their shape. This is done around a foot off of the bottom so that in a seated position, you are in up to your waist or chest, depending on your height. Many people who use their hot tubs as a tool of relaxation prefer this, as it allows you to keep your arms and hands dry so a drink or device can be held while you are soaking. The higher end models also come stock with some added features like jets, waterfalls, and colored lighting. This can be a difference maker for someone looking for a little more in terms of hydrotherapy or aesthetic appeal. 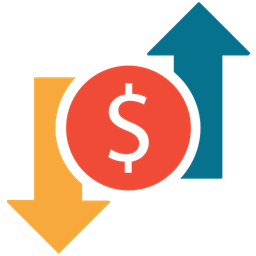 It is important to note, however, that added features often means a higher price point. As the old adage goes, you get what you pay for. The big benefit to the hard-side tub is that it can be used in cold temperatures. Again, this pro is contingent on the regional location of the user and the climate in that location. It is also dependent on the expectation of use. Many people envision themselves outside in their tubs even on cold nights, while some see it as a summer activity. Either way, with the hard-side tub, the option for winter use is present. It is important to note price point as the major con of the hard-side tub in comparison to the inflatable tub. On average, a hard-side plastic hot tub of the same size as an inflatable alternative (fitting roughly four to six people) will cost approximately $2000. This is roughly seventy five percent more expensive than the inflatables on the market. These tubs are also heavier in weight as they are solid and not hollow bodied. That means moving them will require slightly more effort. While they are still totally portable and can be relocated around your yard or patio as the homeowner sees fit, moving a hard-side tub may require the help of a few other people. While seating was mentioned as a pro for the hard-side tub, it is also of note that these seats are often times textured in rough aggregate surfaces as a means of providing a slick free surface to sit on. That means the experience could be slightly uncomfortable if it is not something the user is used to. Steps and small stair sets are also not typically included with hard-side tubs despite often being necessary for entry. Remember, neither the hard-side or the inflatable tub is in ground, so people who struggle to climb may have difficulty with either. This is especially true if your desire to purchase a hot tub is based on a lack of mobility or mobility issues that you are using hydrotherapy to treat. Still, the hard-side tub is more difficult as the tub side is static and less malleable than the inflatable. With the vinyl material of the inflatable tub, users can bring the side down slightly in order to enter. This is not the case with the hard-side alternative. Lastly, the hard-side tub is not easily relocated in doors. If your desired use of your hot tub is not outdoors during the winter, or at all for that matter, housing your hard-side tub in doors may be difficult if you are not properly equipped with the space to do so. To summarize the pros and cons of both the hard-side and inflatable hot tub models on the market, it is important to think about what exactly you are looking for and what your hot tub use will look like. If you are looking for portability, affordability, easy maintenance, comfortable seating, and a tub with which to soak your tired body after a long week, the soft, inflatable tub is probably your best option. These are perfect for people whose price range is under $1000, and who have a place to store it in the winter, or who live in a place where the climate stays warm year round. On the other hand, if hydrotherapy is of major concern with regard to your hot tub search, than inflatable is probably not your best bet. Remember that very few models come with water jets. The water features of an inflatable tub can be more aptly described as bubbling. This will not apply suitable pressure on tense muscles in need of relief. The heat, in and of itself, may be helpful to loosening of tightness in the body, but the heating systems will also not sustain themselves with bubbling feature on. With all that said, if you are seeking the therapeutic benefits of a hot tub, want to house your hot tub outside year round, and believe your yard or patio to have the perfect empty space burning to be filled with a new spa, then hard-side is the way to go. Don’t forget, though, the most important part of any consumer process: price point. The hard-side tub will be much more costly at around $2000. Because it is more difficult to drain, move, and subsequently refill with fresh water, the hard-side tub will also bring on additional maintenance costs. You will need to chemically treat your tub water in order to ensure cleanliness. In conclusion, remember to consider all your options, and the notion of usability to offset cost. For many, the ability to use you hard-side tub year round will be worth the extra price you pay for the initial cost and maintenance. Still, all this is contingent on how you will use it. In the end, be sure to consider the expected use of your tub in order to get the most bang for your buck. This will ensure that you are able to enjoy the relaxation a hot tub can provide your body as well as some peace of mind that you have made the best decision possible for your home. Unless you are installing a portable or an above the ground hot tub, you will need to engage a contractor and qualified electrician. Many local authorities require that wiring be done by a registered electrician. Above ground hot tubs have minimal installations as they come self-contained and installation is on the surface rather than an enclosed space. Even as a DIY, you need a handyman to help with moving the hot tub and aligning to its foundation pad. Your hot tub’s warranty is likely to be voided if you do the electrical and plumbing connections yourself. Your savings in labor cost will not be worth the risk of losing your warranty or failing the inspection. A hot tub contractor will cost you between $1500 and $3500 depending on the size and type of installation. 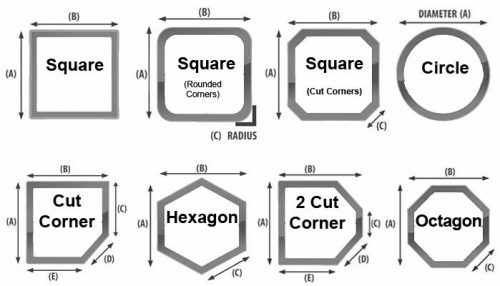 Owners have different preferences, for example round, rectangular, square, octagon, even custom shapes. The inside of the hot tub may by plain or it may have a body contoured sitting space for each user. The tub may have overhead or underwater lights for more dramatic effects. Installation of a hot tub can be rather tricky, considering that the tub is a heavy facility, is technologically complex, and involves the local authorities and the building code. If the hot tub is in-ground, indoors, or on a deck, then you need to contract a general contractor to do the installation. There are three basic stages to installation; preparing the foundation, installing the hot tub, and electrical wiring. In preparation, you first have to check with the local authorities about what permits, licenses, building codes and inspections, and other requirements you need to fulfill for installation. 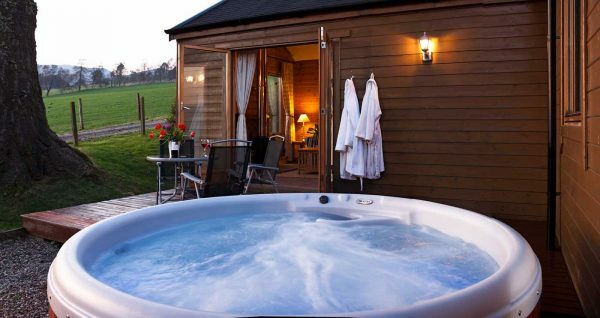 Then select a suitable location for the hot tub. The hot tub should be child-safe by having a fence around it, private from external view, and accessible from the ground level by using padded steps for a raised hot tub. An in-ground hot tub costs significantly more to install than an above ground version. If the hot tub is going to be a distance away from the main house then you have to install a separate electrical system. Moreover, the building code stipulates that the hot tub must be at least five away from the property boundary, not below an overhead power line, and well separated from the tub panel. You have to also ensure there is a passage for the large piece of equipment, and if not, you may have to pull down a fence. You need to assemble the materials and tools for the rest of the installation work. Essential tools will include an excavator or a shovel, a concrete mixer, measuring tape, plumbing and concrete filling tools. For the foundation you will need such materials as gravel, sand, cement, water, and waterproofing chemicals. You will also need deck and fence building materials like wood, nails, railing, paint, and a roof. You will have electrical and plumbing supplies. You will excavate the pit for an in-ground hot tub. The excavated site has to have enough room to work in and for the pump installation as well. You then need to build a strong foundation that will support an 800 pound hot tub, 1200 pounds of water, and 900 pounds of six adult users – in total 3900 pounds. A concrete foundation will cost approximately $5 per square foot or $1000, while a deck will cost between $15 and $35 per square foot or $3000 to $7000. You will also require to pad the concrete foundation. The pad should be strong in order to absorb the impact of extra weights and rough movements of the water and users. The pad also improves the aesthetics of the footprint. A prefabricated pad is desirable because it can be relocated with the tub if the need ever arises. If the hot tub is to be installed on a deck, then you need an expert’s assessment on whether the deck can hold the weight or not. Finally, you have to have trenches for the wiring and plumbing. You will run a conduit along the trench and do the wiring from the house system to the site in line with National Electrical Code. You will later hard wire to the hot tub pump uses a 240V, 50-amp GFCI circuit. Bring the hot tub from the carb to the pad. The empty tub weighs some 800 pounds, 10 feet a side and 3 feet tall, therefore it has to be lifted with a crane or moved on a trolley to the pad. Most hot tubs are self-contained and require minimum installation steps but you need to work with at least one other person to align the hot tub properly. Secure the shell to the concrete base. Connect the wiring to a 240V outlet, the water inlet to the hose, and the water outlet to the sump pump. Fill the sides with concrete and do the finishing with tiles or stone. Clean the hot tub thoroughly, open the air valves, and fill the tub with water using the garden hose or buckets. Turn the electricity on and add chemicals to the water. For electrical installation, some warranties insist the wiring be done by a qualified electrician. Use a dedicated circuit for the hot tub because it draws a lot of power to run the powerful pump, heater, and blower. Use the correct size of copper wire with a heat-resistant nylon covering as stipulated by the National Electrical Code. Use a larger wire from the house to the junction box, and a #6 wire from the junction box to the hot tub. It is not worthwhile to do the wiring yourself at the risk of voiding the warranty and courting a potential disaster. Install the hot tub cover. Be sure to invest in an energy green cover that does not lose heat through soaked up moisture and is made of degradable material. Invest in a sump pump to empty the hot tub because gravity draining can take a full day to complete. Have your completed installation passed by the city inspectorate. A DIY doing an above ground installation will spend approximately $350. The electrician will charge $255 for labor. A general contractor for all-installation work will cost $800 . An in-ground hot tub will cost between $5000 and $15000 to install. You will also spend an extra $2000 to $4000 to build a deck and patio. The cost of transporting the hot tub from manufacturer to the pad will come to around $450. The cost of electrical supplies like wires, insulating tapes, and so forth, will be between $300 and $700. An electrician will cost you $255 to do the entire electrical installation. If you use a plumber then you will fork out another $100 or so. For an above ground hot tub, you need between two and six people and a crane to move and install the hot tub. The seller will arrange for delivery up to your curb, but you have to organize the movement to the backyard. You can use a truck and pallet mover at a cost of $200 to $300, or a hand-towed crane at $120, or a heavy duty crane at $250, or a special wheeler at $100. Throw in $100 for labor and another $100 for site inspection. Portable hot tubs are cheaper to buy at about $1200 to $3500, and weigh just 100 pounds. They are made of vinyl, have a soft surface, and therefore are not long-lasting. They are however comparatively energy-efficient. Any hot tub is a treasured household investment, but you wonder why the price of the hot tub and the cost of installation differ so much. Many factors determine the total cost of installation ranging from materials, quality, sturdiness, aesthetics, ergonomics, to extra features like underwater lights, sound system, and other additional features. The cost also includes getting a permit, labor, transport, building a foundation and shelter, electrical wiring, plumbing, accessories, equipment rentals, initial maintenance and cleaning chemicals, and other miscellaneous costs. There are several hidden costs in energy conservation, maintenance, accessories, repairs and replacement, and winterization. According to Bullfrog Spas the price of a hot tub depends on the customization of features, size, and materials. A customized hot tub depends on the configuration you desire, and orders are made through your local dealer. Bullfrog Spas further explains the general prizing criteria for hot tubs. A luxury hot tub costs between $13000 and $18000, and if it is customized it can reach $40000. It is the ultimate hot tub in terms of quality, features, customization, hard-wearing material, high technical specifications, and low maintenance cost. A lot of engineering and technology goes into their design. Below luxury is the high end hot tub costing in the range $9000 to $12000. It can be customized with a number of luxuries. 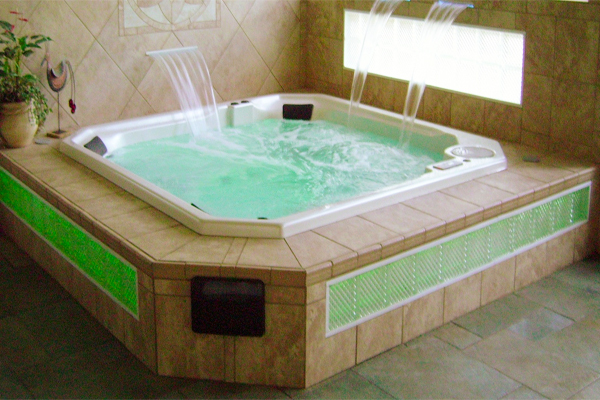 A mid-range hot tub costs from $5000 to $8000, is durable, less hydrotherapic but with good quality, functional features. The entry level hot tub costs between $2000 and $4000. It is standardized, poorly insulated, less durable, and has minimal functionality. It also high maintenance cost and a short lifespan. An imported knock-off costs below $1000. You have to throw in an extra $50 to $450 for a thermo-cover. A good cover has to fit snugly over the hot tub. When ordering the cover you will give the vital measurements. Cover measurements or acrylic-to-acrylic measurements are taken from the outside dimensions of the hot tub. The fold measurements include the “A measurement” or width along the fold, “B measurement” or length, and the “C measurement” or skirt, and the length of the fastening flaps. All measurements are taken from the lips of the hot tub. Although the skirt is cosmetic, it should not be too long otherwise it will cause interference when closing the cover. For rounded corners, use a carpenter’s square to measure the distance to the contact point with the hot tub. A good cover has to be waterproof, arched upwards to allow debris and water to drip off, have a strong, UV resistant vinyl material, strong handles, and a mesh lined, high quality EPS insulator. Use “Ultrashine” for cleaning the cover. Most popular covers cost about $350 but can be as cheap as $50 or as expensive as $450. The hot tub is a status symbol for those with more than a little extra cash to spare. But owning a hot tub has many and hefty costs. An Australian family gave a breakdown of their cost as follows. A 240V electrical wiring cost $1000, a modest wooden deck with reinforced concrete foundation cost $1400, and a year’s supply of water filters $135. The monthly electricity bill that was originally supposed to be $30 but as it turned out it was $50 in summer and $100 in winter. Chemical treatment of the water required $100 worth of monitoring kits and $150 worth of chemicals. The hot tub needed periodic maintenance and repairs which reached $600. The initial cost of installing the hot tub was about $2650 and the initial supplies and kits cost another $300. You will also have to consider the cost of heating the hot tub the first time and each time you replace the water. It costs about $5 to raise the temperature of water from 20 degrees to 45 comfortable temperature of degrees Celsius, and a further $3 to reach the desirable temperature of 70 degrees. In the event of a failure, it would cost $200 to replace the onboard computer, $400 to replace the jets, $100 to fix a pipe leak, and $250 to replace the water pump. A hot tub blower from Sunplay costs between $75 for a 1HP blower and $170 for a 1.5HP, silenced blower. A complete hot tub filter skimmer kit costs about $150, while various parts cost between $10 and $120. In general it costs between $631 and $3520 to repair a hot tub. An off-the-shelf hot tub is cheaper compared to a custom-made one, because it is standardized and mass-produced. 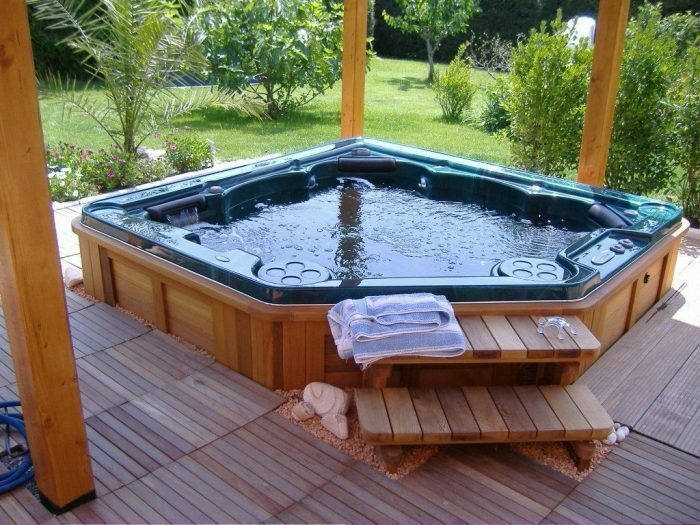 A custom-made hot tub is a high-end product that is individually manufactured and therefore bound to be expensive. A high-end hot tub is laden with technology that monitors water conditions such as temperature, pressure, pH, and clarity. It also controls individual jets for each user. It controls the lighting and sound system. Most hot tubs are installed outdoors, above ground because indoor installation is very expensive and there is no spare room. Ideally installation should be close to the house for privacy and to avoid overexposure to winter weather. The proximity allows you tap electricity directly from the main house and comply with electricity safety standards that require that a 120V, high wattage installation be no more than 20 feet from the fuse box. Shipping costs vary significantly over distance and across states, hence the variation in dealer prices. 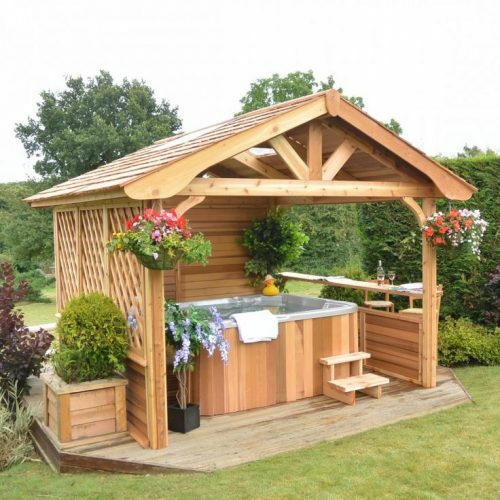 It is desirable to build a canopy, for example a gazebo, over the hot tub because the sun’s UV rays can cause discoloration and flaking of the hot tub’s surface. The hot tub also needs to be properly insulated and winterized so as to retain heat longer and save energy, especially during winter. The outer covering of the hot tub cabinet is made of an acrylic material. The cabinet has to be protected in a wooden and metallic bodywork. Filters cost between $20 and $60 each and need to be replaced annually. The annual insurance premium for hot tubs is about $20. In general the average cost of maintenance of the hot tub is between $500 and $700 per annum, and electricity costs $360. The hot tub is just one item in the complete hot tub setup. Depending on your tub model, a number of accessories are required. A hot tub cover is necessary because it helps to keep the water clean and hot. The cover is a waterproof and thermo-insulator. Thermo-insulation prevents heat loss from the water surface, in turn saving you on electricity bills which, if left unchecked, can run into the $70s per month. Waterproofing prevents dampening and molding which can cause the hot tub walls and water to smell foul. 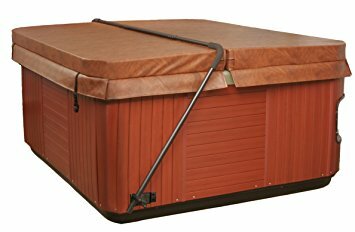 The cover is made of lightweight material that is easy to lift off the hot tub. It is also arched upwards in order that rain water and debris do not accumulate on top of the cover and either cause it to collapse or develop a smell mold. The cost of the cover will depend on its design and materials, but hovers between $50 and $450. A sump pump is needed to drain water when emptying an in-ground hot tub. If you wish to, you can connect extra jets to your hot tub, but you should not overdo it because the jet pressure will reduce or you might have to install a more powerful pump. A water access point is needed for filling the hot tub, usually by use of a garden hosepipe. This is done after three to six months and the water can be recycled by watering the lawn with it. Ozone kills bacteria, algae, and mold while maintaining the gloss on the hot tub’s surface. An ozone gas injector or ozonator generates ozone from water and if installed in the hot tub it can replace the use of chemicals and create a healthier and “greener” hot tub environment. The ozonator costs $100 to $150 and can last between three and five years. It is therefore more economical than using chemicals. An anti-slip staircase for an above ground hot tub enhances safety for the barefooted bathers. A good staircase should have a concrete foundation and padded finish. Although lighting is an optional accessory, it adds to the ambience in the hot tub area, enables night time use of the tub, and ensures safety in poor lighting. A single light fixture costs between $15 and $30. A drink dispenser can be added to the hot tub at a cost of $170 to $200. However, experts warn against drinking and bathing because alcohol and hot water cause excessive dehydration. The heater, pump, and blower consume a lot of energy, making the hot tub the single most electricity consumer in the household. They are also the most likely to fail and be replaced. You can get parts from renowned names like Waterways, Laing, Aquaflow, Jacuzzi, and Vico. A replacement pump, heater element, and blower cost $500, $250 and $200 respectively. The jets cost $75 each to replace. Other replaceable parts are the topside control panel, which regulates temperature, jets, pH, blower, and lights. The control panel costs $500. 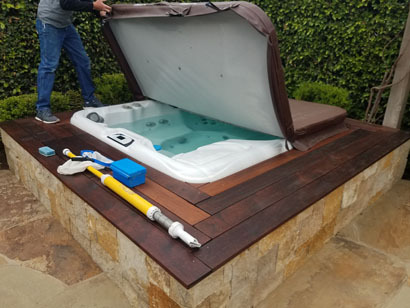 An EPS hot tub cover helps to conserve heat energy by insulating the hot tub, but the cover fold allows significant energy loss by radiation, much like a chimney. A soggy cover is also inefficient besides forming a biofilm of mold, mildew, and bacteria, which are unhealthy to inhale. It costs as much as $60 per month in extra electricity bill to have a soggy cover, therefore it has to be replaced. A new technology in thermos-insulation is air and aluminum insulation, which are good insulators. Air retains most of the absorbed heat while aluminum reflects 95 percent of infrared or heat energy back into the water. The AIRFrame hot tub cover, made by Coverplay, uses this technology. An aluminum frame is made with alternating layers of air and aluminum foils. AirFrame covers are recommended by the Energy Trust of Oregon even though they are expensive – from $650. Accumulated muck can block pipes and jets. A hot tub bio and gunk cleaner or serum, such as Ahh-Some, can clean and remove the muck which is caused by lotions, oils, dirt, and hairs from the body. A hot tub cover protects the hot tub from debris and dirt. The cover can be kept clean and protected by sponging with a dish detergent and rinsing it, brushing away leaves, or by applying the 303 UV protectant. The 303 protectant prevents cracking and fading, restores color, and is waterproof and anti-static to prevent dust and smudges. A pristine mist is used to protect the underside of the hot tub from odors and discoloration. A hot tub cleaning agent or a mild dish washing detergent can be used to sponge clean the hot tub and give it a fresh smell. A polish gel is used to polish and shine the surface of the hot tub. You will be astounded by the number of chemicals you need to add before you start using your newly installed hot tub and as part of future tub maintenance. The cost of chemicals is affordable, for example bromide and chlorine cost between $10 and $20 per month. Bacteria, mold, mildew, and algae grow on the hot tub and have to be treated with chlorine or bromide and an algaecide. Bromide is used in hot water and it does not cause irritation like chlorine. An oxidizer is needed to activate the bromide. Chlorine and bromide in liquid, tablet, nugget, or granular form is added to the water to kill microorganisms. If the pH value of water is higher than 7.8 or lower than 7.2 the hot tub’s bodywork will be stained. Muriatic acid is added to reduce alkalinity and soda ash is added to increase alkalinity. A stabilizer such as cyanuric acid is added to the chlorine to stabilize it against the sun’s UV light. A salt chlorinator system, such as the Solaxx Saltron Mini, can be used to extract chlorine from salt and it does not cause eye irritation. It can however cause corrosion on the bodywork. An ozonator, such as Del Ozone Eclipse and Solar Eclipse, produces ozone from water, which neutralizes water contaminants. It reduces chemical use by up to 90 percent. An algaecide will kill any algae growing in the hot tub. You should use pH test strips or install an electronic pH tester for monitoring the pH levels in the water. Adjust the hardness of water by adding either calcium chloride to soft water or sodium bisulphate and muriatic acid to hard water. Hardness flakes off the hot tub surface. In order to stop water from freezing during winter, you need to cover the water surface with an air pillow, gravel pea in plastic bottles, or an antifreeze agent. Drain the hot tub and use the blower to clear the water jets and a wet-and-dry VAC to clear the pipes. Rinse any moisture residue with a towel and cover the hot tub. You have to ensure that children, pets, and wildlife are safe near the hot tub area by fencing off the area and keeping the cover on and secured when the hot tub is not in use. Make sure that guest users know how to operate the panel and equipment safely. Get the latest copy of the Model Aquatic Health Code (MAHC) from their website. It is a detailed document detailing the standards of construction and the safety guidelines/code for spas, hot tubs, pools, and other aquatic facilities. The penalty for accidents can be hefty. High end models are expensive to buy but cheaper to maintain, as opposed to low end models which are cheaper to buy but expensive to maintain. Normally, high end hot tubs are not advertised online. Considering the life-time cost of ownership, the high end hot tub is actually cheaper since it has a low cost of maintenance, long lifespan, and a high resale value.